Election Commission announces Assembly polls dates of four states. Simultaneous elections in Rajasthan, Madhya Pradesh, Chhattisgarh, Mizoram and Telangana to be held before December 15. 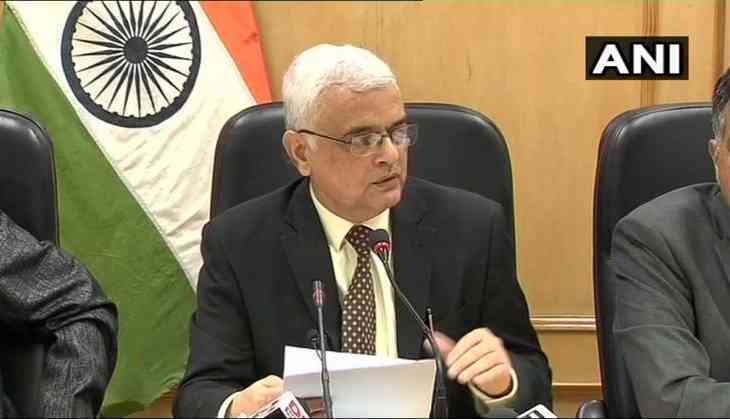 Model of conduct to come into force in Madhya Pradesh, Rajasthan, Chhattisgarh, Telangana and Mizoram with immediate effect, said Chief Election Commissioner OP Rawat in Delhi. Madhya Pradesh and Mizoram assembly elections to be held on 28th November. While Rajasthan and Telangana assembly elections to be held on 7th December. Counting of the votes to be done on 11 December for all the five states, i.e. Madhya Pradesh, Chhattisgarh, Mizoram, Rajasthan and Telangana state assembly elections. The By-polls in Shimoga, Bellary and Mandya in Karnataka to be held on 3rd November. Speaking on a fake IDs in Madhya Pradesh, Election Commssion said they haven't received any complaints in this regards, if received, action will be taken. "We haven't received any such complaint from Madhya Pradesh. If any complaint is received, EC will take action; FIR will be lodged. Nobody can do anything with fake ID. It's checked at every level for identification," CEC OP Rawat said.